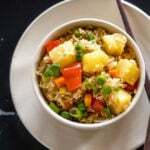 Welcome back to Cook With Manali Valentine’s Day series and we are on recipe #3 already! 😀 I was telling my husband yesterday that I need to cut down on my baking spree. That’s nothing unusual though, I tell him that once every 2 days and so he has got so used to it that now he just looks at me and says “fine” . Just plain simple “fine”. He knows this is one thing I cannot do, like cannot especially when there are like so many occasions to bake. I always feel that there’s “too much to bake & too little time”! 😉 First there was Christmas and now there’s Valentine’s Day and then there will be Easter. You see it cannot stop! Can you blame me? I don’t care much about Valentine’s day as far as celebrating is concerned but baking treats and desserts? Well that’s a different story altogether because I get super excited to whip up all these awesome desserts during festivals and special occasions. 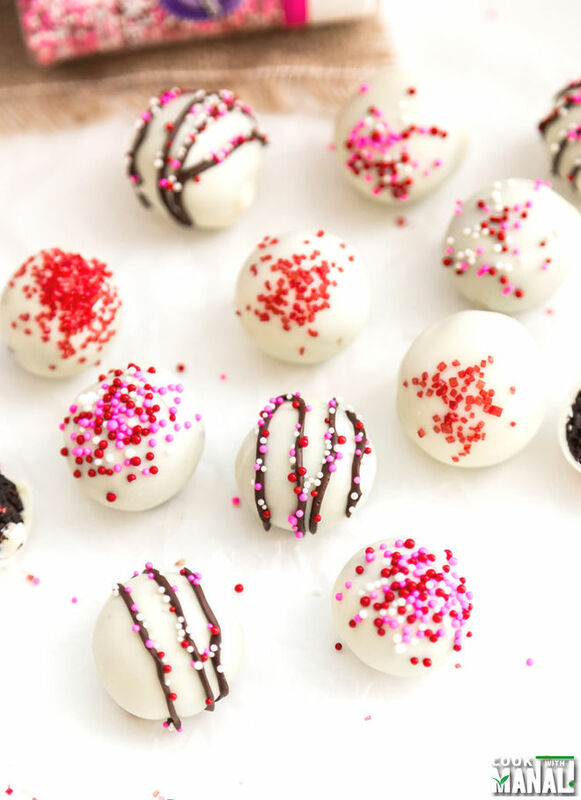 Today’s recipe is of a no bake, super easy and super delicious white chocolate oreo truffle. 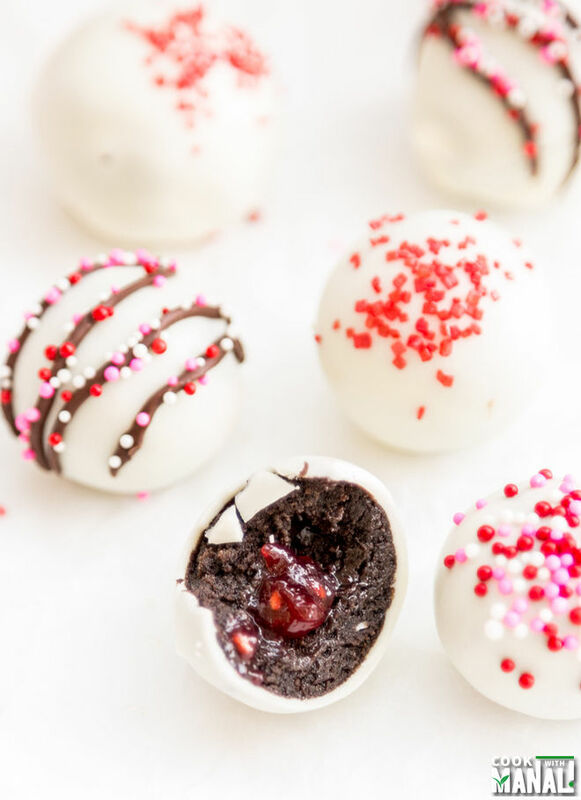 And to give it a little twist for Valentine’s day, I added some raspberry jam in the center so that when you bite into it, other than the soft oreo truffle you also have a raspberry surprise in the center! Oh god, my mouth is watering writing this because I can imagine the truffle melting in my mouth! 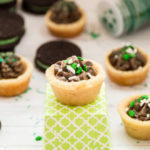 This is one of easiest treats that I have made and my husband said it’s also one of the best I have made! 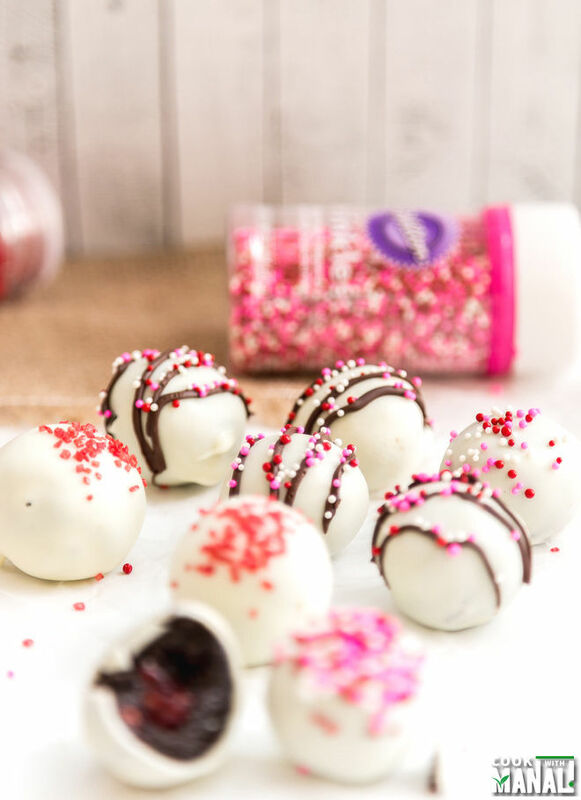 Super simple with only 3 key ingredients, these white chocolate oreo truffles will definitely make your “special someone” smile this Valentine’s Day! So let’s see, what we need for this truffle. Basically these 3 ingredients is what makes these truffles. So even if you don’t have raspberry jam or those sprinkles, don’t worry the truffles would still taste just as awesome. Ok I need to tell you guys something about these candy melts/melting wafers. I have previously used Wilton Candy melt since it’s readily available plus it comes in so many colors during the festivals so it’s obvious I always get it. But this time around I used Ghirardelli White Melting Wafers for these truffles and oh my god, the stuff is awesome! Seriously it’s so smooth, tastes awesome, I mean I have not been paid to say this but I couldn’t stop myself from sharing this with you guys. Yes it’s expensive but the stuff is so good, melts so well and remains silky smooth. You know they say you have to pay for the price, I understood that today. I think they only make dark, white and milk chocolate melting wafers so yeah for the colored ones I might have to go back to wilton again but for these, I am never going back! Anyway back to the recipe, to make oreo truffles is super easy. All you need is to pulse the oreo cookies in your food processor and then add in the softened cream cheese. Once the dough is formed, make little balls out of it. I used a small cookie scoop to make sure the balls were equal in size and got around 21-22 of them. Take 1 ball, make a depression in the center and fill it with very little [around 1/8 teaspoon] raspberry jam. Seal the edges and give it a round shape again. 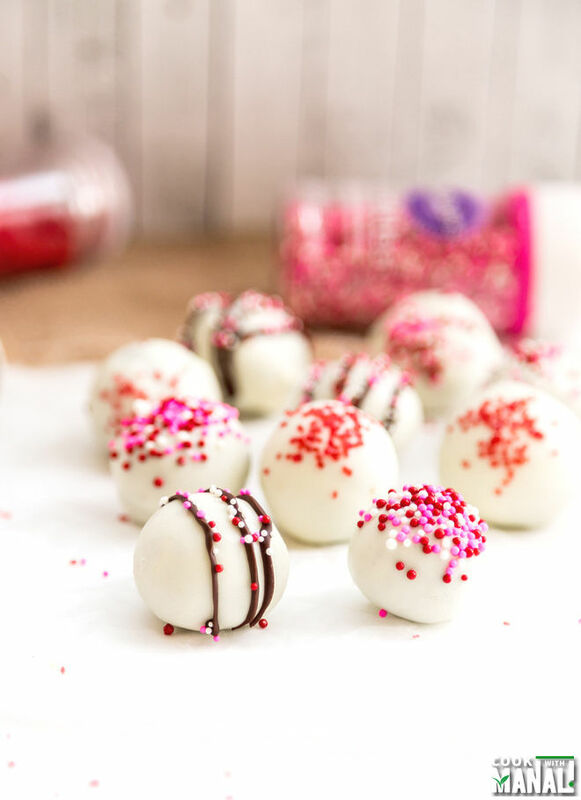 You can use more raspberry jam for the filling if you make larger truffles. Since mine were quite small, I added only little jam so that it remains contained in the truffle. 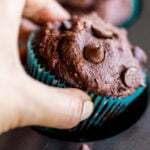 Keep arranging the balls on a baking pan lined with parchment paper as you make them. Once all balls are done, place them in the freezer for 1-2 hours. Melt the white chocolate and dip the truffles in once chilled! Top with sprinkles to make them look festive and that’s about it. So easy right? And did I say so delicious as well with a raspberry center in between! 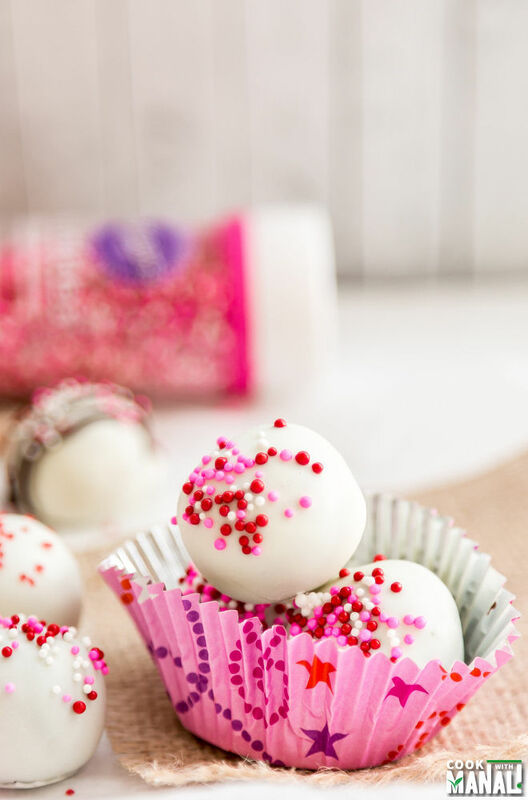 These are the cutest little Valentine’s day treats and are sure to be loved by everyone. Using a food processor, pulse the oreo cookies [along with the cream inside] till completely crushed. You can also put them in a ziplock bag and whack with a rolling pin till completely crushed. Add softened cream cheese and mix. I actually think this works best by hand so even though not in the picture, I did use my hands to mix in the cream cheese. Mix till all cream cheese is well incorporated and mixture comes together as a dough. It will be sticky. Line a baking sheet with parchment paper and set aside. Using a small cookie scoop make around 20-24 small balls from the dough. Flatten each ball and make a depression in the center. Fill the center with very little raspberry jam [around 1/8 teaspoon]. Make sure you add very little jam else it will ooze out of the truffle and you don’t want that. Of course you can fill more if you make bigger truffles. Seal the edges to close the truffle and place on the baking tray lined with parchment paper. Repeat with the remaining balls. Once done place the tray in the freezer [not refrigerator but freezer] for 1-2 hours. Chilling is mandatory. 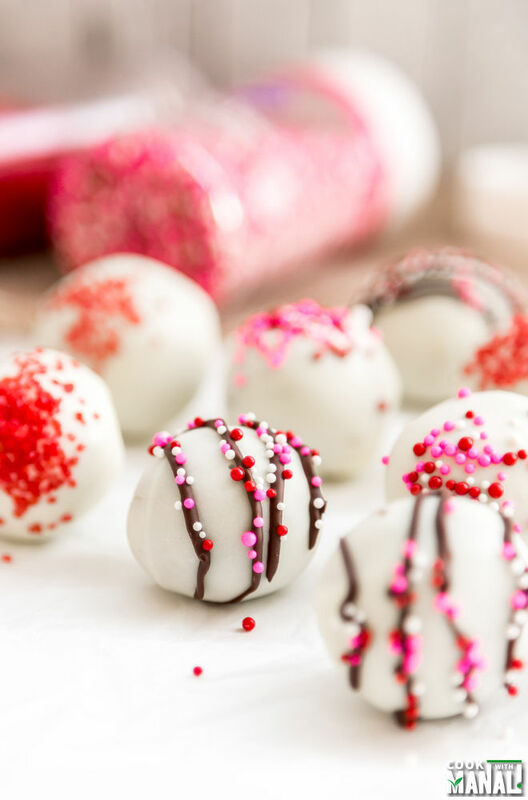 Once the truffles are chilled, take white chocolate wafers/melts in a bowl and melt the chocolate either in a microwave or using a double boiler method. Once the chocolate is melted insert toothpicks in all the chilled balls. Take one ball at a time and dip it in the melted chocolate. Spin the truffle to coat it with the chocolate all over. Insert the truffle with the toothpick into a block of styrofoam. Immediately top the truffle with sprinkles before the chocolate sets. The chocolate sets pretty quickly. Remove the toothpick from the truffle once the chocolate sets, it comes out easily. To drizzle some milk/dark chocolate on top, let the white chocolate set first and then drizzle melted milk/dark chocolate on top. Keep the truffles refrigerated, if they are able to last that long in the first place! I can’t tell you how difficult it was for me to stop popping them into my mouth one after another while clicking these pictures! And yes sorry for way too many pictures, they just looked so pretty, I couldn’t resist! * I strongly recommend using Ghirardelli White Melting Wafers. Not only does it tastes incredible, it also melts so smoothly. * Use very little raspberry jam in the center, it’s just to have that little surprise in the center. * If you don’t have styrofoam, just use a fork to dip the truffle, coat from all sides and then place on a parchment paper. I just find this toothpick and styrofoam method easier. * It’s not necessary to fill in the raspberry jam in all the truffles. I kept few plain as well. 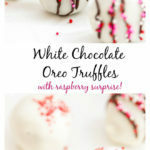 White Chocolate Oreo Truffles with Raspberry surprise in the center make the cutest Valentine's Day treat! Using a food processor, pulse the oreo cookies [along with the cream inside] till completely crushed. Add softened cream cheese and mix. I used my hands to mix in the cream cheese. Using a small cookie scoop make around 20-24 small balls from the dough. Flatten each ball and make a depression in the center. Fill the center with very little raspberry jam [around 1/8 teaspoon]. Make sure you add very little jam else it will ooze out of the truffle and you don't want that. Of course you can fill more if you make bigger truffles. Seal the edges to close the truffle and place on the baking tray lined with parchment paper. Repeat with the remaining balls. Once done place the tray in the freezer for 1-2 hours. Chilling is mandatory. 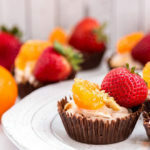 When the truffles are chilled, take while chocolate wafers/melts in a bowl and melt the chocolate either in a microwave or using a double boiler method. Insert the truffle with the toothpick into a block of styrofoam. Immediately top the truffle with sprinkles before the chocolate sets. The chocolate sets pretty quickly. Remove the toothpick from the truffle once the chocolate sets, it comes out easily. I am loving your Valentine’s Day serie!! So many great ideas. 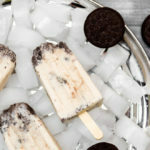 You can never go wrong with Oreos so this is a must-do. Have a great weekend! Pinned. Aww thanks Oriana! I’m glad you are liking the series! Thanks for the pin! Ooooh girl, that raspberry center has got me drooling. Festive AND delicious? Yes yes yes. Thank you Sarah! It’s definitely both! And now my mouth is watering! As soon as I read, raspberry surprise in the center, I was done!! I need to have these in my life! Pinned! Thanks Annie, these are so delicious! Manali, they look so cute! I love bite-size treats. I’m thinking about a peanut butter surprise lol. Pinned! Thanks Azu! Ooo peanut butter would be awesome..you must make that! I adore that raspberry center! I want a whole box of these for Valentine’s Day! Anything Oreo related is a dessert meant for me. 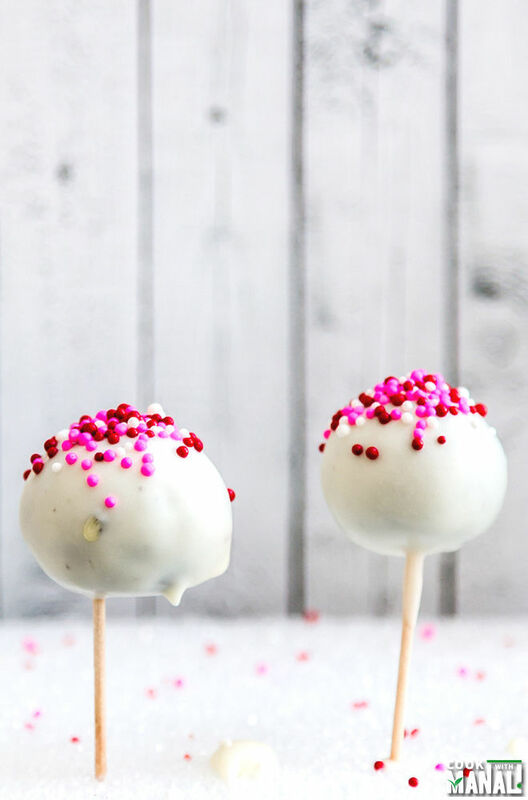 These look delicious and cute, love the cake pop aesthetic too. Me too! Love oreos, thanks Pamela! beautiful looking truffles, Manali! I so want to pick one and eat! I’m a huge oreo fan and your raspberry surprise is killing me!! I want some! Thanks Savita! Comer over, I still have a lot of truffles! Thanks Gingi, glad you like! These are the cutest truffles, Manali! Such a perfect Valentine’s treat! Love the raspberry in here, too! Pinned! These look gorgeous Manali! Of course better than store bought! Love the hidden surprise inside! Thanks Mira, they taste yum! 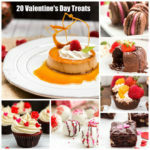 Wow, another gorgeous Valentine’s Day treat! These look amazing! Pretty!!! Yummy!!! Purrfect for Valentines! These are great for Valentine’s day. I really like the rasberry surprise in the middle. 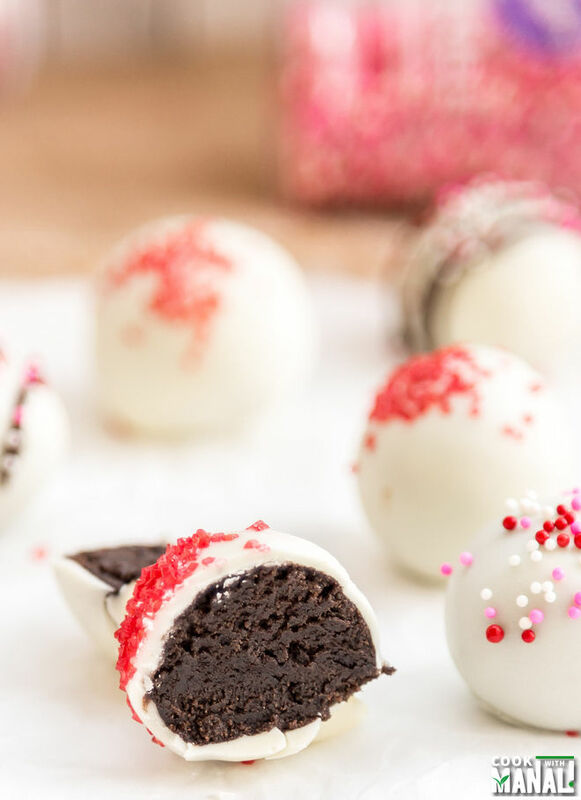 Oreo truffles are extremely addicting! I agree, they are really addicting! Thanks Vanessa! I love these!! 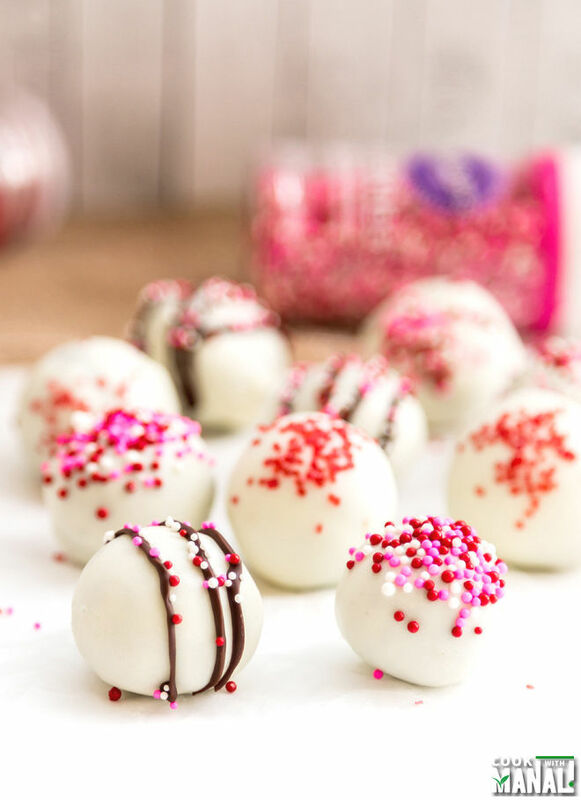 White chocolate and raspberry is one of my favorite combinations, and these look so perfectly poppable, I would probably devour way too many. Thanks Rachel..It’s an awesome combination indeed! I am seriously drooling over these!!! and the cherry in the center just made it over the top amazing!!! I tried these truffles and it turned out great. 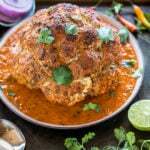 Thanks for such an amazing recipe. 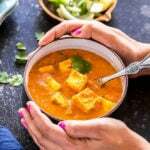 Thank you so much for the feedback Shree..glad you like the recipe 🙂 Have a lovely weekend! What a delicious looking treat. Can’t wait to make this!